When everyone else is beating the path from Delhi to Agra to see the Taj Mahal, you’ll be heading north to Ladakh, near the border of Tibet, for an altogether different side of India. High up here in the Himalayas, life really slows down, and your days are reduced to gorgeous walks, mountain greenery, impossibly fresh air, and a cup of tea with a monk. Shahrookh Cambata from , who is organizing part of the amazing India trip we’re giving away, is a big fan. There's not a ton to do in Ladakh. Just being here is the experience. LADAKH, India – Known as Little Tibet, the barren landscape on the roof of the world is almost an otherworldly experience. It is not easy to describe the sensation of traveling up to the peaks of the mighty Himalayas. Sheer walls of rock divide Tibet from Jammi and Kashmir, the northernmost Indian state where Ladakh is located. The ruggedness of the region is one reason that one of the oldest Tantric Buddhist sects remained undisturbed, protected by geography. From November to May, Ladakh is almost completely cut off from the world. Even during the summer, the best season to go, getting there involves crossing the highest mountain passes in the world. This makes arriving in Ladakh deeply rewarding, both physically and spiritually. 1. Stay in Leh, the capital town along the trade route between India and China that has welcomed travelers since the 1st century CE. is really the only grand hotel in town. 2. The imposing, Tibetan-inspired Leh Palace was built in the 17th century and only inhabited until the mid-19th. It is now in ruins, although restorations are underway.The Ladakhi royal family now lives in nearby Stok Palace, which has a beautiful museum and library. 3. If you only do one thing, have a breakfast at , in Shey, where the monks feed the local children. 4. At more than 18,000 feet, is the world's highest road. 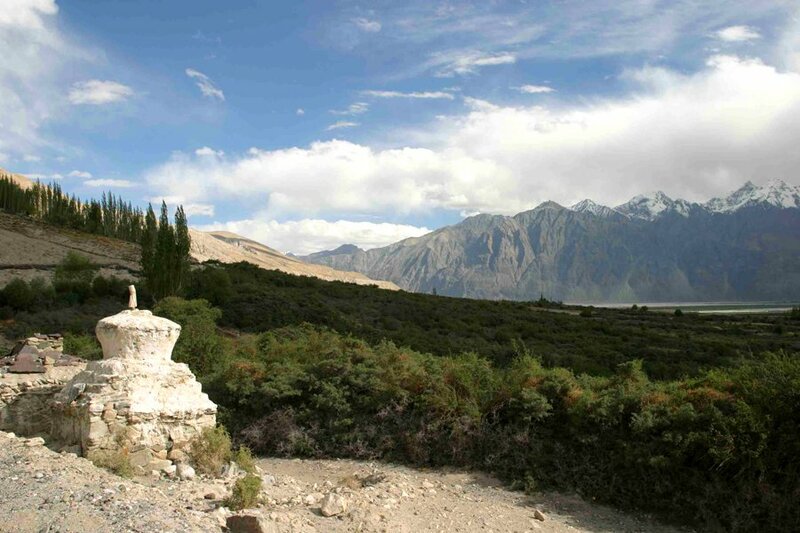 It makes for an incredible journey that ends up in Nubra Valley. Once there, you can trek to Ensa Monastery and ride a double-humped camel, which is especially fun with kids. 5. Dietary restrictions, many based on relgion, have an influence on menus in Ladakh. You'll rarely see meat on menus other than chicken and occasionally trout. My favorite restaaurants in Leh include Bon Appettit (multi cuisine) and Tibetan Kitchen (Tibetan and Chinese food): Both are cheap and cheerful and both serve alcohol. German Bakery and Lala's Café are two other good spots. A cup of hot butter tea with Buddhist monks. A walk through the local bazaars. The spectacular view of the Himalayas. There's nothing like them on Earth. (Dirt Track Productions) is an award-winning documentary about one man's motorcycle journey from Mumbai to the Changthang Plateau in Ladakh. The trailer is beautiful, and really gives a sense of what the area is like. Fly: You can fly from Delhi to Leh, the capital of Ladakh. Train: The most beautiful route is on Rohtang Pass, which takes passengers from Manali to Leh and offers a picturesque view of mountains, valleys, and incredible roads that cling to the sides of the mountain range. Car: Once you're in Leh, it's easy to arrange chauffer-driven vehicles or taxis. Comfortable clothes are a must, and remember that the culture is very conservative. Women should not wear short or revealing clothing. Tipping or gratuities are not expected but are appreciated for a job well done. Shahrookh is the CEO of in Highland Park, Illinois. His two passions are writing software code and traveling. He travels for the experience and enjoyment, and to discover more about India.